Bradford, Vermont is located about 30 miles from the Hanover-Lebanon area. Bradford is a bustling village best known for Farmway, a store that sells just about everything from clothing and food to furniture and farm equipment. Bradford has maintained it's agricultural roots, and you will still find several working farms in town. 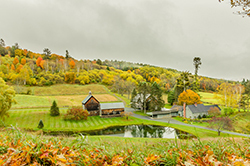 Scroll down to find all current real estate for sale in Bradford, VT. Contact us if you have questions or would like to learn more about a listing. To learn more about Bradford, click here! This 2006 stick built home sits on 3.89 acres just minutes from town and I-91. Inside, an over-sized mudroom, office, half bath, first floor laundry and a large eat in Kitchen with granite counters, pantry and a large island great for entertaining with friends and family. Enjoy the open concept dining/living area with easy access to a private back deck perfect for grilling or the covered front porch where you can find shade from the hot summer sun. Upstairs a large master bedroom with a walk in closet and mountain views. Down the hall a full bath and two additional bedrooms. The full unfinished basement with high ceilings will be a wonderful space for future expansion. This charming home is set back from a paved road just outside the village of Bradford. Large level yard with mature trees. There's even a barn out back that would be great for storage or workshop. The layout of the house lends itself to many different uses. Spacious living room with large windows looking out over the back yard. Private yet easy access to town and I91. Great family home tucked away just off Rowell Brook Road. +- 1 mile from the I-91 ramp. This is actually a very large house with multiple options for an extra bedroom, or additional Family Room/Office/Studio/ What every you want to make use of this 250 sf space situated at one end of the house. The rooms are spacious, you have a private back yard and spacious front yard. And for the Garage Lovers this is a magnificent 24' x 32' 2 car heated garage with work space and a full attic for storage. It is another great selling feature of this property. Come take a look! Meticulously maintained home on a corner lot off a paved town road. Beautifully finished with 6 paneled wood doors, hardwood floors throughout and custom kitchen cabinets. Features a covered porch, full basement, and outbuilding for extra storage space. Impressive, one level residence that is perfect for retirement.